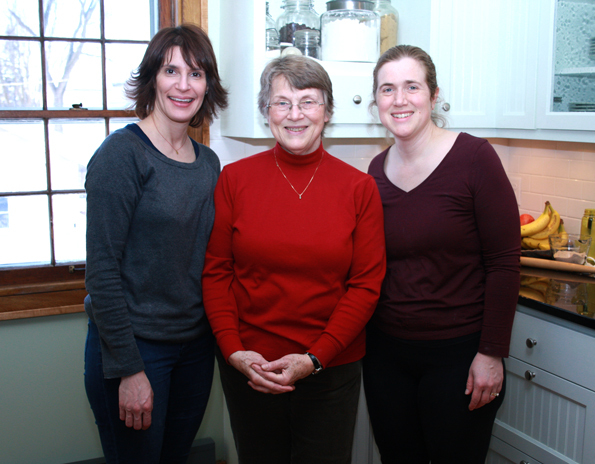 Baking Gluten Free Bread ... in Minnesota! (Plus a Giveaway) | Great gluten free recipes for every occasion. This is us! Well, the winners and me. From the Gluten Free on a Shoestring Bakes Bread Big and BIGGER Giveaway. Left to right, above: Me, Hilma Cooper (the actual winner!) and Anneke Krall (the winner’s lovely daughter). I thought you might like to see what we did, and how it all went. It happened in Minnesota. In January. I went from cold and snowy New York … to colder and even snowier Minnesota. ‘Cause I’m that kind of girl. And since I couldn’t decide whether posting this would make you feel happy (yay! for the winner!) or mad (thanksfornothing, Nicole, I didn’t win and thanks for reminding me), I’m just closing my eyes and jumping in. 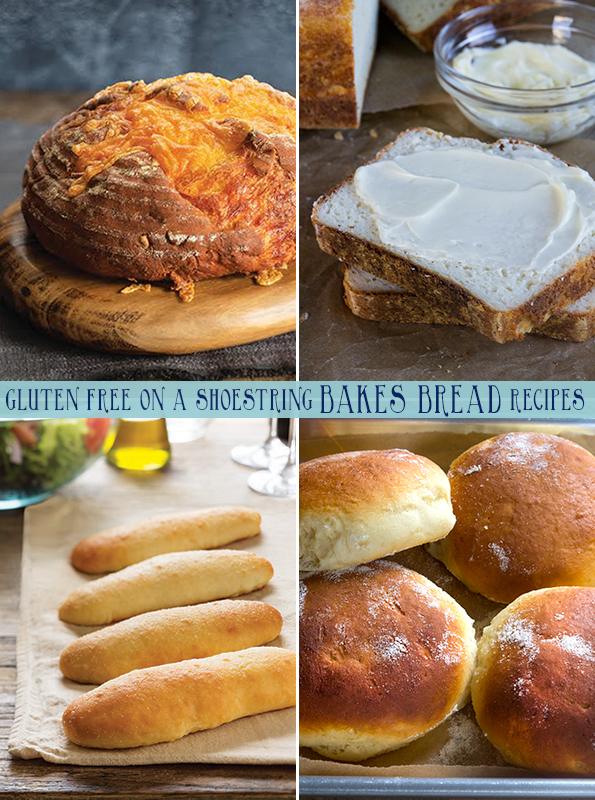 That, and adding in another Giveaway of 2 signed copies of Gluten Free on a Shoestring Bakes Bread. Woohoo! This is gonna be a dead simple giveaway. Leave a comment below (saying whatever you like, as long as it’s polite!) and you’re entered. Done. Comments on Facebook don’t count. Emailed comments don’t count! Just sign in the Disqus in one of the many ways it allows, and comment away. Hopefully about something related to gluten free bread? I dunno. Giveaway ends Sunday night, February 9, 2014. Like, before I go to bed. And I’m no night owl. Sorry about the Morning Person thing. It can be very annoying, I know. Signed books go out from my local post office on Monday (okay, Tuesday at the latest if I have any trouble getting winners’ addresses). 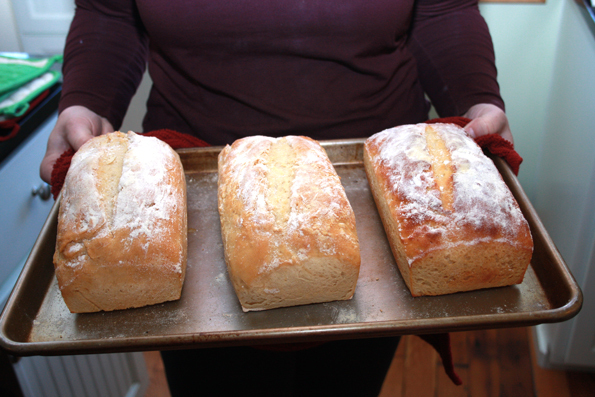 Here’s what we did: 3 loaves of Lean Crusty White Sandwich Bread (page 43 GFOAS Bakes Bread). They took forever to rise. Hello! It’s really cold and dry in Minnesota in January! So, we had to be super patient. Ask Anneke what happened. Okay fine I’ll tell you: I just kept saying, “It’ll be fine. Just hang on.” And … it was! Read the Bread FAQs. All true. Anneke was totally prepared. She had a big batch of the Bread Flour from pages 8-9 (want a calculator to do the math for you? go here). And lots and lots of 2 liter proofing buckets of gluten free bread dough proofing in the refrigerator, most for 2-3 days. This is all pictured in Chapter 3 of Bakes Bread, and you should know that Anneke was pretty nervous. But she was a total pro! She just had to relax and trust herself. You don’t need my 2 old lady dishpan hands there with you. You have the step by step photos in the book. And you have my voice in your ear. Well, at least you have however you think my voice sounds from the way I write. Or something like that. We had bread in the oven (look! 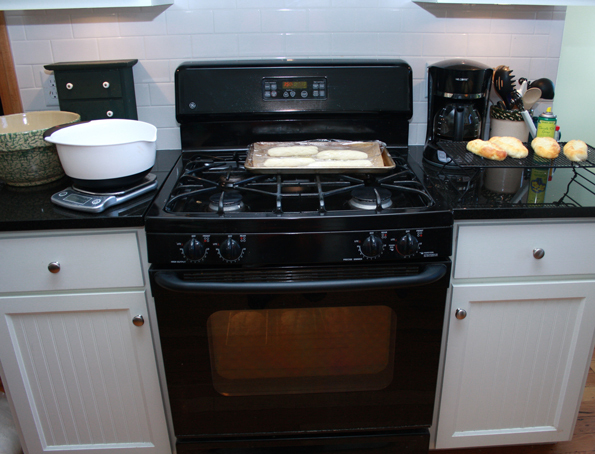 the 3 loaves from above) and rolls proofing on the stovetop. It was like a regular day in my own house! Oh, right. 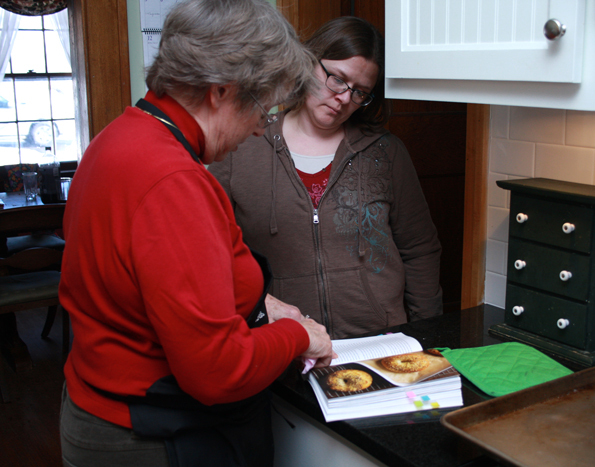 We also made bagels (that’s Donia with Anneke’s mom—she and Anneke are friends and she traveled 7 hours by car to hang out with us, too! Jennifer came, too, but she stayed far away from the camera). Anneke’s family ate them speedy quick, hot out of the oven. With butter. Like you’re meant to do. Don’t have your copy of Bakes Bread yet (whatcha waiting for?)? Here are 4 recipes from the book (below) to get you started. You know, to convince you that it really does work and it really is a Gluten Free Bread Revolution! Oh, right! I almost forgot: Would you like to Bake Gluten Free Bread Together? I can’t afford to pay for another trip across the country, I’m afraid (none of this was sponsored—it was all on me, so that I could do it my way, without having to pander to one brand or another). But I would be willing to hop in the car and travel a reasonable distance (say, about 200 miles in any direction from New York City?) if YOU (yes you!) would like to organize a Gluten Free Bread Baking Class for me to teach. My time will be free. The rest is up to you! To reach out, leave a comment below letting me know that you’d like to organize a class, or contact me through the form on the blog. We’ll bake whatever bread recipes you like, and you and your friends and acquaintances can take it all home! Thank you, Anneke for hosting such a wonderful day, Hilma for being such a gracious winner, and Donia and Jennifer for coming from far and wide to bake with us! P.S. Don’t forget to enter to win a signed copy of Bakes Bread by leaving a comment below! Giveaway closes Sunday night, and books go out right away. 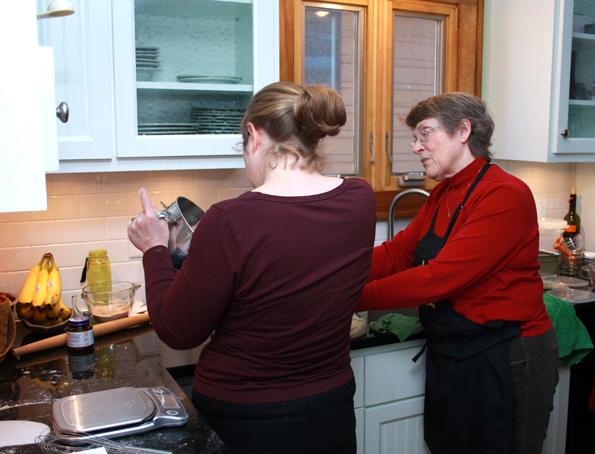 Want to organize a gluten free bread baking class? Let me know! Being new to the gluten-free world, this cookbook would be perfect! I am a newbie as well. I would love a cookbook. I would love to win this book for my father. Thank you for your GF wizardry! I already have the bread book, but I’d love to give it to a GF newbie. I’m teaching GF classes at our local culinary school. Oh, how I wish I were within your 200 mile radius, or I’d let you take over the one I have coming up about breads! ;) Which recipe would you recommend we do, since it’s a one-time class? I’d like to send them home with rolls for Easter, but not sure which recipe to use (from your original book or GFSBB). Would love to try & win your book as I am newly GF. Thanks! I would love a copy of your book! Your recipes are amazing! Keep on sharing! Thank you! Would love a copy of your newest book! I have your first and use your blog frequently. I just recently made your yeast free pita breads for gyros. I am dreaming of making one of the yummy recipes. Thank you! I am a very frustrated bread maker because I LOVE yeast bread, great texture, and whole grains. It is next to impossible to find a decent GF bread, until now. I am brand new to your blog but have been gluten-free for 5 years. I am ordering your cookbook and plan to try some of the yummies I’ve seen on your Facebook page. Please keep blogging! Making bread always intimidated me, until I had my twins. One of my twins has Autism with a Gluten sensitivity. I am now on a mission to fearlessly make bread that she will eat, as well as the rest of the family! I’ve made a couple gluten free breads but i am afraid of the yeast breads, i really want to learn how to make them! Would love to try making my own gluten free bread! Always amazed by how wonderful everything looks! Looking forward to trying the recipes! I would love this. Its hard to find cook books with yummy recipes in it. Ive loved all the recipes I’ve made form your blog I know I’d love your book! I can’t wait to try the gluten-free bread recipe! I so miss having bread in my newly diagnosed gluten-free life! New to Gluten free, as my health now requires it. These photos look really good. I am hoping I can learn how to cook gluten free foods. These breads look awesome & delicious! Love baking bread…especially during this particularly snowy and cold NY winter! Thank you for your blog and cook books. I always send my friends to your blog when they become GF. Love the recipes. Still learning my way GF as a celiac and these help. Thanks! How have I never found this website before? Can’t wait to try out the recipes! I have to bake my own GF breads because store bought loaves are too petite. A slice of cheese is larger than a slice of Udi’s plus $6 a loaf gets expensive. Hershey, PA (The Sweetest Place on Earth) is only 161 away from NYC according to MapQuest. A spring/summer class here could be combined with a family trip to Hersheypark :) How many people would we need to gather for a class? I just have to add…. Oh my goodness! I have been missing the mother load! Wow! I just subscribed and I know I’ve been way to busy. I’ve totally missed out up until now on your blog! I’m so excited. I’ve only had my iPhone since Mother’s Day and I’m often forgetting how great a resource it is. I’m rarely on a computer. One question is your cookbook available on Nook? Well thank you again! Hi! I’m I’m very glad to have received a post about your book. A dear friend introduced me to your recipes and I’m very thankful. I have a lot of trouble with inflammation and eating gluten free is a huge help. It’s been a long road and trying to find yummy bread. I’m so encouraged by the photos above and that the kids loved it too! I’m excited to bring gluten free foods to my entire family. The title on a shoestring was a great pick! It caught my attention. Thank you for all of your hard work and the gift of free recipes. Thank you for the opportunity to win the book! I would LOVE to host a party but I’m in Maryland, sounds like too far?? Bread… The one thing I probably miss most of all. I would love a copy of your latest book! awww I have your GF on a shoestring quick and easy.I would love to get your new book! Too bad I don’t live closer…if you thought Minnesota was cold come a little further north to Manitoba, Canada. We’re having the coldest winter on record or the last 100 years; something like that. Baking bread might help warm up the house! I would love to win this book. The whole family has recently made the switch to GF to support my husband and his need to be GF. I use to bake everything from scratch. But my GF baking could use a little help. My daughter is gluten-free, milk-free, and I’m trying hard to avoid wheat for health reasons. I would love to try some of these recipes – they look so easy and delicious! My daughter is now GF and it has been very hard to find a bread she likes. Can’t wait to try some of your recipes. I just baked your English Muffin Bread. It is wonderful! Thank you for sharing all of your hard work. I would love to win your latest book! I bought your Quick and Easy book – love it! Thanks again. I was diagnosed with celiac a year ago. After trying gluten free bread I stopped eating bread as the smell, taste and texture are repulsive to me. A couple of weeks ago I stumbled onto your blog … I was intrigued by your precise well tested bread recipes. 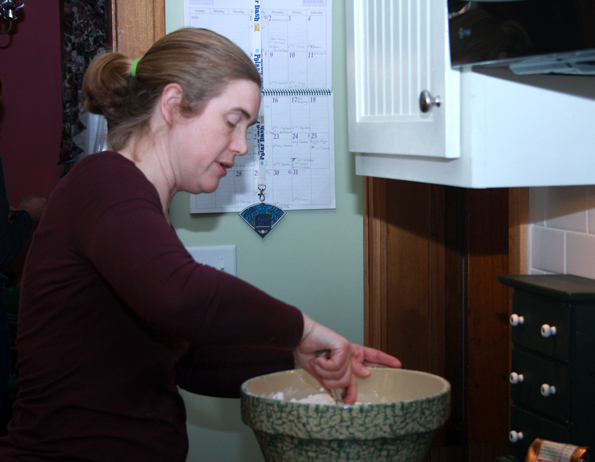 I was also totally intimidated by the thought of baking my own bread…. I didn’t think I had the patience or “knack” for it. And I also have an irrational fear of yeast. However as I spent more time reading your blog I began to believe I could do it so I bought your bread book, read and re-read the recipes and stocked up on all recommended tools/ingredients. I made the dough on Weds. gave it the long rise and baked the Lean Crusty White Bread today. It worked!!! Crusty, tangy delicious gluten free bread that I actually baked (with the help of your book, your blog and your video on shaping)! Nicole – you are the bread goddess!! Thank you for all your hard work!! 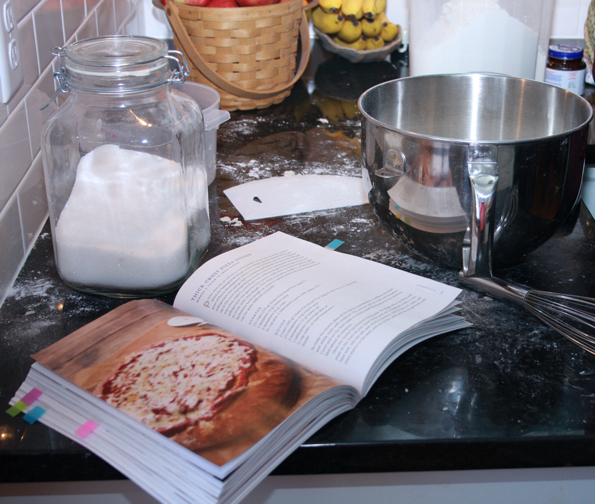 I can’t wait to bake my way through your book.